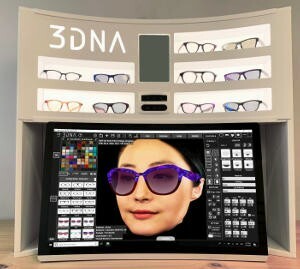 Eye-DNA, an optical solutions company based in Hong Kong, has launched its latest interactive virtual kiosk which is a compact version of its 3DNA Eyewear system that integrates 3D scanning and design to provide user designed and precisely fit eyewear. Combination: frames comprised of metal temples and bridges, with frame fronts made from acetate, horn and carbon fiber. mass-produced eyewear, can easily design and order frames on a per-patient basis.